Netflix released the first season of the rebooted Space Sci-Fi drama Lost in Space on April 13, 2018. 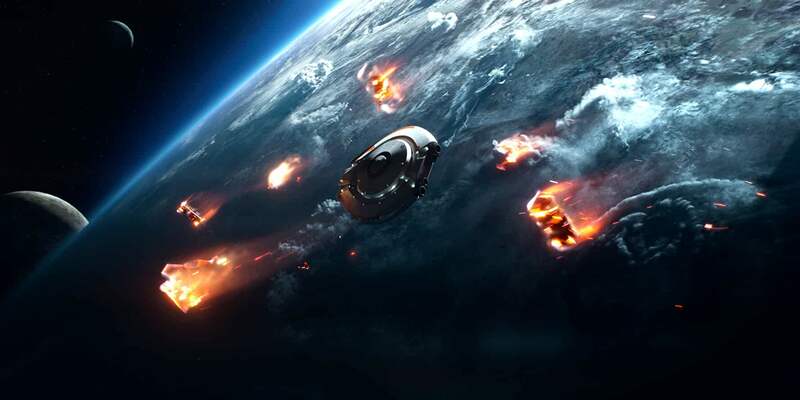 Set in 2046, the plot basically portrays a mysterious meteor called Christmas star hitting the surface of Earth making it inhabitable and forcing the humans to look for a new habitable planet. The mothership Resolute runs through a space-time disruption taking all the small ships called Jupiters along with it. These Jupiters get crashed on an unknown planet trillions of light years away where the survival story of the families riding them begins. 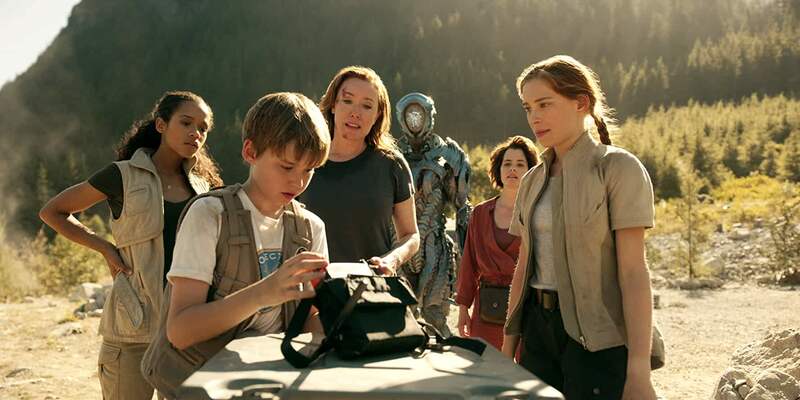 Lost in Space starts off its journey on a high with beautiful cinematography and amazing VFX and CGI as we get to see the Robinson family on board of Jupiter 2 crashing on the surface of an unknown planet. But hang on right there, and don’t get deceived by the beauty yet, as there are some depressing scenes very early in the show. The first two episodes were quite entertaining but thereafter the show goes downhill as it struggles to create a proper grip and displays an uninteresting story-line. Even the performances were not exactly up to the mark at the beginning but it got better as the season progressed. The storytelling remained average and frustrating for sometime and had some plot-holes which were easily visible at times. We get to see an alien AI Robot and trust me it or as they’d like to say, HE might as well be amongst the best things offered by the show. To my surprise, the Robot’s character development was indeed quite impressive and yes peeps, he has got a character after all. The friendship display between the 11 year old Will Robinson (Maxwell Jenkins) and the alien Robot is heart warming and very adorable. They had quite the bond and the Robot remains keen on protecting his buddy everytime. The same goes for Will as we see the little kid is quite protective of his personal Robot. The portrayal of Will’s innocence felt a bit clichéd at times but still it was done well enough. As the season proceeds, we get to know about the origin details of the Robinsons via flashbacks. We learn that the bond between the father John Robinson (Toby Stephens) and the rest of the family is not all on good terms as during their stay on Earth, John being in the military had to stay away from his family for days. The mother Maureen Robinson (Molly Parker) loves her husband but is unable to trust him and his relationship with the children. Then there are the kids Will, Penny (Mina Sundwall) and Judy (Taylor Russell) each of who were quite adorable and enjoyable characters. The character of Judy went through a hell of a transformation and development which was the peaks of the show. Being just an 18 year old Doctor, she had to go through a lot and had to be the most matured one who eventually had to take care of the family as well as others. My personal favorite character from the Robinson family would be Penny Robinson. She was amazing with her puns and humor throughout the season and at the same time was quite caring and responsible for her age. Now, the show wasn’t limited only to the Robinsons. Ignacio Serrichio as Don West, a mechanic who was also a smuggler, gave a stunning performance. Just like Penny, Don was amazing with his humor and he ultimately found that family in the Robinsons, he longed for. And oh my, how can I forget his relationship with the chicken Debbie? It was so heart touching! And then there’s the old fashioned villain June Harris played by Parker Posey, which in my opinion was definitely amongst the lows. Although Parker was decent in her role, but the writing of the character of June felt cringy and very irritating at times. She takes up the alias of a certain Dr Smith and is invited to stay amongst the Robinsons. Dr Smith’s been written as a very clichéd villain who is up to no good and is concerned only about herself. In the process she’d do anything and everything to survive no matter how dumb the actions. She’s one of those characters whom you would surely hate but not really love to hate. Like whenever she was on the screen, she used to frustrate the hell out of me considering even her backstory which we learn via the flashbacks wasn’t exactly convincing at all. Lost in Space picks up good in the second half of the season. The story-telling improves and the last two episodes were the best out of the mediocre debut season. The best part of the show was indeed the visuals. The cinematography was breathtaking throughout and the CGI was top notch. I might as well say these were some of the best space visuals I’ve ever seen and certainly the best for a Space Sci-Fi series up till now. Even the BGM was truly ear pleasing all the time. Netflix has been doing a great job in this section lately. Overall, the show felt a bit confused with its intentions. It wasn’t exactly a must watch from my side and felt a bit disappointing as I had very high expectations from this one. That being said, it’s definitely watchable with some cooler moments and amazing visuals and I’d love them to explore more into the universe considering they left the finale on a cliffhanger. VERDICT:- Netflix‘s latest rebooted Space Sci-Fi drama Lost in Space‘s season 1 lacked the necessary grip and had quite an average storytelling early on but improved well enough in the second half, setting the base for a probable season 2 with a scope as well as hope of improvement. It isn’t exactly a must watch but the visuals and BGM fill up for the mediocre story-line making it watchable as well as enjoyable.